Sue Lawley's castaway is businessman and broadcaster Simon Cowell. Sue Lawley's castaway this week is the television star Simon Cowell. 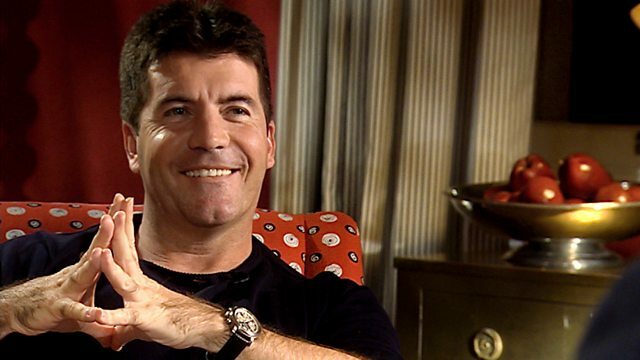 Simon Cowell is one of our most successful pop music moguls. He is the mastermind behind more than 100 number one songs in Britain and abroad and Westlife, whom he signed, holds the record for having seven consecutive number one songs in the UK. A lot of his early successes were gimmicky hits - singing wrestlers, the Power Rangers and Teletubbies - but it was first Robson and Jerome and then Westlife who brought him credibility. His tenacity and his ability to spot a seller were already legendary within the music world when he devised a format for a television show that would bring new talent to the fore. Pop Idol, American Idol and now The X Factor launched the careers of Will Young and Gareth Gates among others. They've made Simon Cowell a celebrity too. His shows play to the aspirations of the young, who believe fame and fortune can be theirs. But when their ambitions exceed their talent, he's there to tell them. He's reduced many contestants to tears and been threatened by others but, he says, he's only being cruel to be kind. BBC Radio Two Songs of the Century. The Best of Charles Aznavour. The All time Greatest Love Songs. Wild, Cool & Swingin': Wayne Newton. If You're Not the One. Stories behind the record labels and the people at the top of the Music Business.